Customize your own Air Gliders! 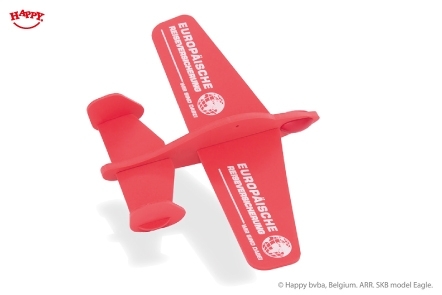 The Happy Air Gliders are the perfect budget-friendly giveaway, for in- and outdoor use. 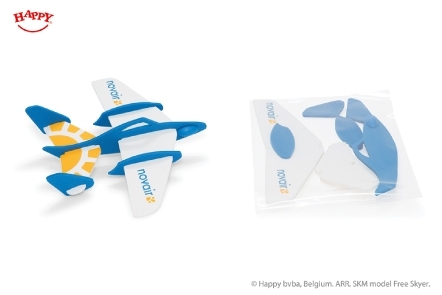 These flying logo carriers will definitely draw attention and bring a huge smile to peoples faces! The Air Gliders are made out of high quality solid EVA-foam, for 100 % manufactured in Europe. 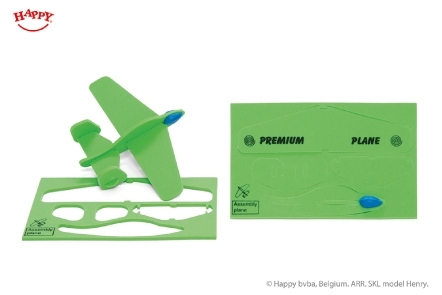 They are fully customizable: not only can you choose the printing technique, foam colours and Air Glider model, you can even add your own card to the package. How to customize my own Air Gliders? - Do you want the print to be as sharp and clear as possible? We have 3 different Air Glider sizes in our gamma: little, middle and big. They are all super light weight and thus perfect fun mailing items. Here you find all the details concerning the Air Glider sizes and models. This is the little foam Air Glider assembled next to its package: the frame. We offer one Air Glider model in the small size: model Henry. 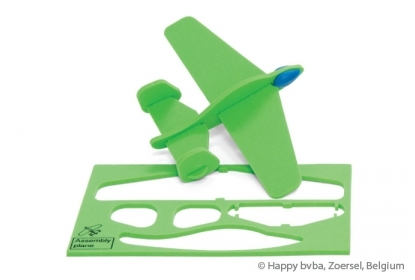 The little Air Glider comes entirely in one foam colour, because it's always flat packed in its foam frame. Thin and light, the perfect mailing item to send to your customers. The little Air Glider is wrapped in a plastic transparent bag. 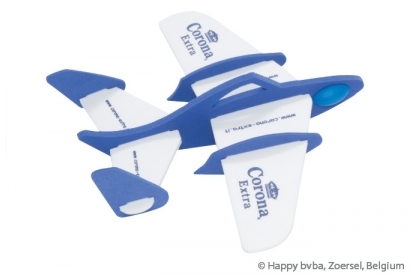 This middle foam Air Glider exists out of two foam colours: white and blue and the logo is screen printed with blue ink. The middle sized foam Air Glider is model Free Skyer. 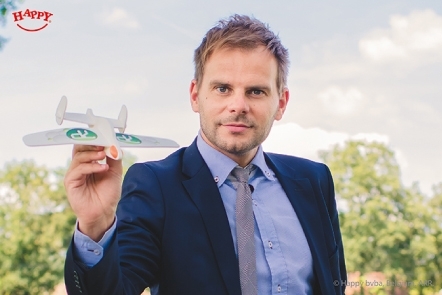 Compared to the little Air Glider, the middle Air Glider has two extra small wing parts on the big wing. A similar model as the Free Skyer exists in the big size and is called Condor. The loose pieces of the middle Air Glider are packed in a transparent plastic bag. Air Glider model Colibri. Two colours screen print on white foam. 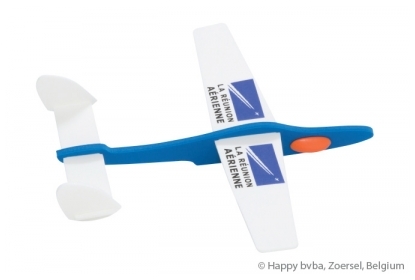 In the big size we have 3 Air Glider models: Colibri, Condor and Eagle. 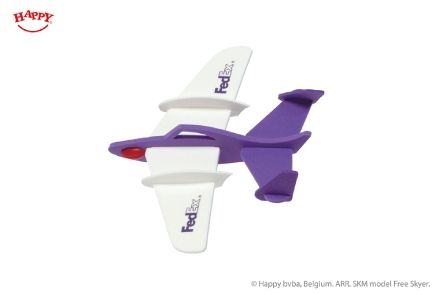 Thanks to their big wings, an extra balanced flight is guaranteed! Model Eagle provides the largest printable surface, to make your logo stand out. The loose pieces of the big Air Glider models come packed in a transparent plastic bag. 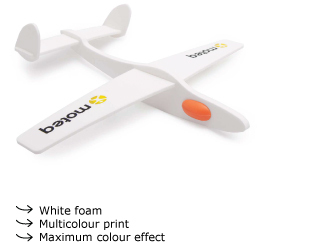 It is possible to choose up to 3 different foam colours for the middle and big Air Glider models. You can pick a different colour for the body, the wings and the small parts of the Air Glider. 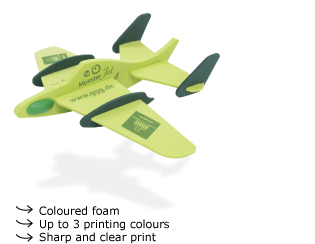 Remember, the little sized Air Glider is made in one single foam colour. We offer a wide range of colours, fully tailored to your wishes. You can choose between our standard EVA foam colours, special colours or a customised Pantone colour. Since we value fast deliveries, we selected 8 standard colours, which are available in stock. To make the perfect match with your logo, there are more than 300 other colours to make your Happy promotional gift as personal as you want. The almond-shaped nose weight let's the Air Glider fly balanced through the air. The nose weight is available in following colours: yellow, orange, red, white, green, blue and black. Choose the colour that fits your logo and foam colours best. Maximise play fun by opting for a rubber band. 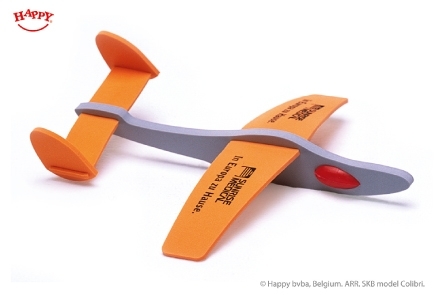 Pull the rubber band and shoot the Air Glider fast and smoothly through the air! We offer you the possibility to add a customized card inside the plastic transparent bag together with the Air Glider. The size of the card depends on the chosen Air Glider model. This option can give an extra touch to your present. Send us your design in PDF together with your completed price quote and the print-ready template (see step 8.Template). Once you have gone through all the steps and made your choice, fill in the price quote to ask for a tailor-made offer. With the order you will receive our air glider template and detailed guidelines, enabling you to make a print-ready design.